304 SS and Inconel® 600. Also available with Super Omegaclad® XL Sheath! ANSI Code Sheath Material Sheath Dia. Notes: *Specify Junction: (G)rounded, (E)xposed or (U)ngrounded. Super OMEGACLAD™ XL probes (highlighted in yellow) are also available in N calibration; substitute TJ36-NNXL for TJ36-CAXL in Model Number. 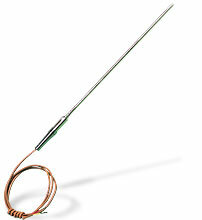 Nota: Additional PFA Lead wire and probe lengths are also available; contact Sales.